This is a 17-games-in-one collaborative cart for Pico-8. There have been a couple of 16-in-1 jams done before but these tend to be presented as 16 standalone games with a menu screen to pick between them. I wanted to do something that was an homage to Lazy Jones on the C64 (https://www.youtube.com/watch?v=Y7DyoDJCqac), where you have 16 mini-games but also an overarching 17th game that ties them all together. 17 games, from 16 different developers in 10 countries: UK, USA, Canada, Australia, France, Russia, Hungary, Norway, Finland, Sweden. It all fits into 32k of memory. Contributors were: @Liquidream @platformalist @p01 @gruber_music @egordorichev @brintown @Enargy @viza @MrHodgepants @kometbomb @johanpeitz @2DArray @GregosEl @dollarone, plus UncleSporky and... me! Fly around space collecting crystals to open “anomalies”. Each one will send you to another dimension where a weird challenge will present itself. Do well and your ship will be refuelled accordingly! Try to get through all 16 anomalies before you run out of fuel. 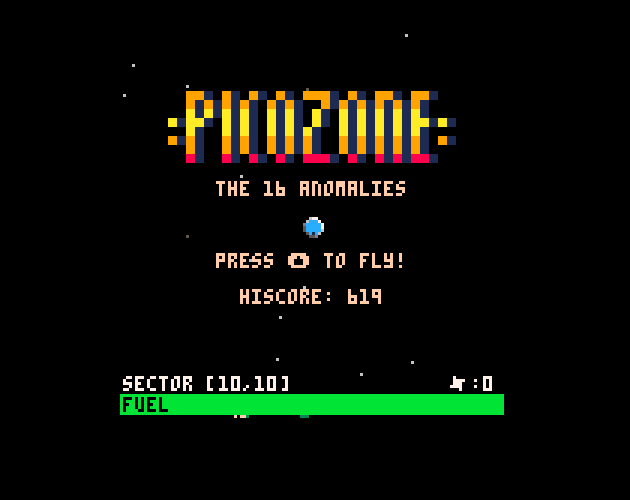 All mini-games run using the arrow keys, plus Z and X on the keyboard, which correspond to the Pico-8’s O and X button prompts respectively.